What is a Prolonged Air Leak? In surgeries where part of the lung has been removed, air leaks are common problems. 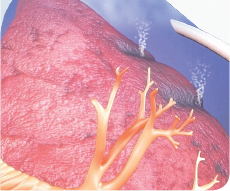 Air leaks are caused because the lung tissue does not always close completely after surgery. Air that continues to leak from the lung(s) can build up in the patient’s chest and can make breathing difficult. 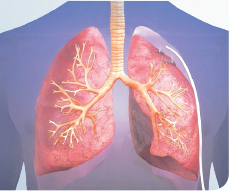 Air leaks are usually treated with a temporary tube inserted into the chest cavity (chest tube) that removes the air from between the lung and the ribcage (see Figure 1a and b). In most cases air leaks will close after a few days. However, some patients will have a leak that does not close. These are referred to as “prolonged” air leaks. If you have more questions about air leaks please discuss them with your doctor. Figure 1 a and b. Chest tube inserted to remove air between lung and ribcage due to lung air leak. 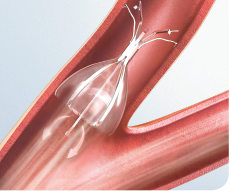 The umbrella shaped valve is made of a flexible metal frame (nitinol – composed of titanium and nickel) covered by a thin sheet of flexible plastic, a polymer membrane (see Figures 2a and b). The valve is designed to fit the shape and size of airways of the lung. The valve is a one-way device, which means that the plastic umbrella blocks air from moving further into your lungs toward the air leak, but allows trapped air to move out of your lungs as you breath out. Blocking air from reaching the air leak is what may help the air leak heal. The valve has five flexible anchors that settle into the airway wall helping the valve stay in place. The valves are available in a few different sizes to fit various airways. 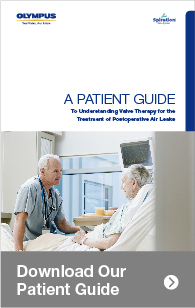 The valve is designed to be removed once the air leak has healed. Figure 2 a and b. 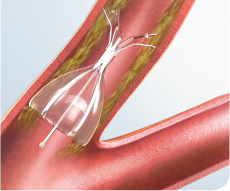 Illustration of the Spiration Valve blocking new air while allowing trapped air and fluids to escape. Dooms CA, Decaluwe H, Yserbyt J, et.al. Bronchial valve treatment for pulmonary air leak after anatomic lung resection for cancer. Eur Respir J. November 2013. Wood DE, Lauer LM, Layton A, et.al. Prolonged length of stay associated with air leak following pulmonary resection has a negative impact on hospital margin. Clinicoecon Outcomes Res. 2016;8:187-195.